We talk with german band WILLOW CHILD. “Paradise & Nadir” release 11/04/2018 on StoneFree Records. DenpaFuzz: First things first, I want to thank your words and congratulate for your “Paradise & Nadir”. A record that can be easily idenfied with the tag “retro-rock”. Do you like this term to define your music? How do you define your style? WILLOW CHILD (Javier): Well, while we do refer to our genre as “retro-rock” we aren’t quite sure if this is totally correct. It’s just an easy and quick way to get a very brief idea of what we do. I don’t think we’re doing just retro-rock. I mean the band originally started out as a cover band that played songs by Janis Joplin, Jimi Hendrix, the Doors, Led Zep, etc… So there’s definitely some retro-vibe to us. BUT we also do love some contemporary music such as Greenleaf and Graveyard. Also every member of the band adds his personal influences. Flo for example (our “youngest” member, entered the band in June 2017) is a huge Pink Floyd admirer. And when you compare our “Trip Down Memory Lane EP” to “Paradise & Nadir” you’ll get it real fast! As from my side: I grew up with a lot of Grunge. Pearl Jam, Nirvana and the Foo Fighters got me into music in the first place. After that Stoner Rock (Kyuss, Fu Manchu, QOTSA, Slo Burn, ..) really hit me hard. And I like to think that we do have some 90s sound elements, too. As a conclusion I’d say we do play rock music that has a lot of retro heritage to it but does try display more than one musical era. DenpaFuzz: Please, tell us how the band was born and who you look at when it is me to compose your music. Which bands are your references or inspire you? Oh that is a wide field right there! As I mentioned we all do have very different tastes in music. Of course we share a lot of bands that we like. We visit festivals and concerts together all the time. But let me think of some new bands we ALL dig at the moment: KADAVAR, WUCAN, GREENLEAF, THE GOLDEN VOID, COOGAN’S BLUFF, ASTROBOY, DEATH ALLEY, HORISONT, KING FATHER BABOON (who are very good friends), HONEYMOON DISEASE and sooo many more! DenpaFuzz: What had changed from your first EP to “Paradise & Nadir”? 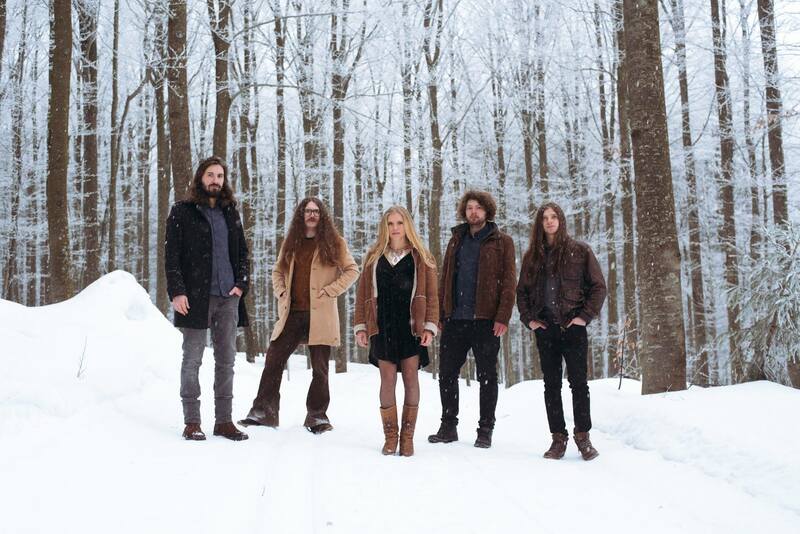 The idea of union with nature is evident, both in the lyrics and in the ambience created in the tracks; even the promo pics you show up in the middle of a snowy forest. Do you try to escape from fast paced and stressful urban environments? WILLOW CHILD (Javier): Well, the most obvious change would be our change in the Line-Up: Flo Ryan Kiss (Ex-Limestone Whale) joined us on lead guitar. This opened up our musical range very vast. Of course, now we have the ability to feature organ AND guitar in every song and in some songs even two guitars. But also Flo’s know-how and musical style made writing Paradise & Nadir a much more complex and fulfilling process. You really hit the nail on the head when you stress out that our songs are very focused on nature pretty much all the time. This is due to Eva. She’s usually the mastermind behind the song. While we all do write parts and riffs and hooks, Eva would ALWAYS put a point on it with her lyrics and vocals. So while someone has a rough idea where his riff or groove is going after Eva has heard it we very often end up referring to nature in some way. This is very characteristics to WILLOW CHILD. We actually do not want to “escape” from the fast, momentary and complex digital everyday world. We acknowledge that it’s there and we live in it but since attentiveness and meditation are some topics that we personally pursue it’s come to us quite naturally to focus on the “easier” and more comfortable things on this planet. Personally, I believe that the human mind nowadays is being constantly overwhelmed by all the brain has to process throughout the day. I like to compare our living situation to the musicians in the 60s and 70s. So when I get up, I would check my various mail accounts, take a peek into facebook and so on. Most people own a smartphone and are therefore accessible about 90 per cent of their lifetime. That 40 years ago was completely different. For me it’s great inspiration to watch movies or TV Shows out of that time or read/watch interviews with artists who worked in the 60s and 70s trying to grasp what their everyday life was all about. DenpaFuzz: Although following a similar path, I appreciate some differences from your EP “Trip Down Memory Lane”. En “Paradise & Nadir” the organ has a strong presence. Is this a consequence of Jonas’ accident, which prevented him from playing guitar? It seems like if the organ sound compensated the absence of the guitar chords, is this the idea behind of it? WILLOW CHILD (Javier): No, the idea was never to compensate something musically. While it is true that Jonas had some difficulties playing the guitar after his accident this fact wasn’t even part of the discussion if we wanted to get another guitar player (Flo). It was more of a logical development after Flo was finally in. We are very lucky that Jonas injuries healed off very fast and pretty good as well. So he basically regained all of his sleight of his left hand. But with Flo in the band we noticed pretty quick that there was just a lot more possibilities for the organ. I wouldn’t even say it was a conscious process we just made music together and afterwards saw “Well, that it quite a new role the organ can fulfill from now on.” And with the organ having a stronger more present role, we were able to go more progressive ways in terms of songwriting. DenpaFuzz: On the other hand, Eva’s vocal register seems to have become sweeter, with more feeling, if possible. It is impossible to me not to recall Grace Slick (Jefferson Airplane) when I hear her voice in several tracks of the record. WILLOW CHILD (Eva): I used the time that went by since we finished the our EP to improve my singing game. Flo taking over on lead guitar, meaning less guitar work for me, gave me headroom to really focus on my vocal parts. Now, I enjoy putting even more time and work in my vocal lines and lyrics. I’m happy if it already shows on “Paradise & Nadir”! I don’t necessarily identify much with Grace Slick. To be honest, I never thought about it, but maybe the sound of our voices is a bit similar. Although, I think that we have different styles of singing. So, I tend to say any resemblance is flattering but unintended. DenpaFuzz: Also, in the new album there are up as a band? Is this the path the band wants to follow, moving away from sounds that could re more tracks with progressive touches, somemes even folk. Is this a queson of growing semble stoner rock? evolvement! As mentioned before, having Flo in the band brought a new range of Genres to the mix. Folk being one of them, quite obviously. But I would like to separate the song structures from the sounds. What I’m saying is: While we definitely do not want to just recreate what’s been there a thousand times before in terms of songwriting I think we will still try to mix some well-known sounds in. So, WILLOW CHILD won’t be a “traditional” folk band, neither will we completely drift away to all too progressive styles. We still want to play and write Rock and Roll but the goal is to display as many influences and historical resemblances as possible! DenpaFuzz: How are those weekends in which you throw away the key of your rehearsal room and keep playing for hours together? Rehearse, eat (and drink), sleep, repeat. As a result, we ended up spending weekends with everyday about 12 to 15 hours in the room doing what we love. Hard work but worth every second, as you can probably tell! DenpaFuzz: Do you keep playing all that me to have fun doing it or is it playing, playing unl the songs are perfect? WILLOW CHILD (Javier): If it only was that easy, haha. It’s totally a bit of both, really. We do want the songs to be perfect and have fun making them. So there’s two sides of a song being perfect: One is that the structure is clear and there are special moments here and there, stops, licks and all that, but there’s also the sound that has to fit the topic of the song (also if you look at the lyrics). We want you to be able to get a feeling of the song’s story before you even hear the lyrics. I guess you could say we want to create an atmosphere that allows you to emotionally be ready for the lyrics. The other side of a perfect song would be the song has to be performed perfectly. So, we would also talk A LOT about what exactly each of us is doing. Sometimes playing a 10 seconds phrase back and forth for hours until every note and everything is not only tight but carries the same power and meaning in the expression of the note. DenpaFuzz: How will you approach this summer filled with festivals and other events? WILLOW CHILD (Javier): After the Release-Show on May 11 th in our hometown Nuremberg, we will take one week of before we will go on tour for 17 days! We will play Austria (Linz & Vienna) and then Germany from the very south (Munich) up into the north (Hamburg). Regarding festivals we will play WUDZDOG OPEN AIR in Dornstadt (GER) with bands like MY BABY. Our Festival highlight in 2018 will be ROCK IM WALD in Lichtenfels (GER). This is one of the main German (or European) Vintage-Rock/Stoner-Rock/Psychedelic Festivals and we’re super psyched about this gig. We will join the line-up with ORANGE GOBLIN, MUSTASCH, THE VINTAGE CARAVAN, SPIDERGAWD, STONED JESUS, and many more great bands! From DenpaFuzz we want to thank you your words and wish you luck with you new album,which will be reviewed here. And we wish see you playing Spain soon. La formación alemana WILLOW CHILD nos habla sobre la banda y nos desvela detalles sobre su nuevo disco “PARADISE & NADIR” que verá la luz el próximo 11 de mayo via StoneFree Records. DenpaFuzz: Lo primero de todo, desde DenpaFuzz, quiero daros las gracias por vuestras palabras y la enhorabuena por “Paradise & Nadir”. Un disco donde el término “retro-rock” se ve plenamente identificado. ¿Os sentís vosotros identificados con ese término para definir vuestra música? ¿Cómo definiríais vuestro estilo? WILLOW CHILD (Javier): Si bien es cierto que definimos nuestro género como “retro-rock” no estamos seguros de que esta etiqueta sea totalmente correcta. Es una forma fácil y rápida de tener una somera idea de lo que hacemos. Pero no creo que simplemente hagamos “retro-rock”. Es decir, es cierto que la banda empiezo tocando temas de Janis Joplin, Jimi Hendrix, The Doors, Led Zeppelin, etc, por lo que tenemos un aire retro. Pero también nos gusta mucha música contemporánea como Greenleaf y Graveyard. Además, cada miembro de la banda aporta sus influencias personales. Flo (nuestro miembro más reciente; entró en la banda en junio de 2017), por ejemplo, es muy fan de Pink floyd. ¡Y cuando comparas nuestro “Trip Down Memory Lane EP” con “Paradise & Nadir” te das cuenta rápidamente! Por mi parte, crecí escuchando mucho Grunge. Pearl Jam, Nirvana y Foo Fighters hicieron que me picara el gusanillo de la música. Después, el Stoner Rock (Kyuss, Fu Manchu, QOTSA, Slo Burn…) me marcó profundamente. Y me gusta pensar que también tenemos algunos toques de los 90. Eva es el miembro principal de Willow Child; está a cargo de las voces y de las letras, por lo que su herencia musical es clave a la hora de definir a qué sonamos. Desde Rockabilly a Blues Rock clásico; Eva cuenta entre sus influencias a cantantes como Janis Joplin, Jim Morrison, Steve Nicks, Janis Martin… Como conclusión diría que hacemos un rock que cuenta con una amplia herencia del pasado pero que intenta representar más que una sola etapa musical. DenpaFuzz: Contarnos como nace la banda y en quien os veis reflejados a la hora de componer. ¿Qué bandas os inspiran o son vuestro referente? WILLOW CHILD (Javier): La banda se creó como banda de amigos del instituto en 2012 cuando Jonas (teclados) y Oxi (nuestro bajista previo) entraron en la orquesta del instituto y empezaron una banda con Dave a la batería, tras un periodo de cambios en los miembros. La banda se llamaba “Trip Down Memory Lane” y tocaban versiones como comentaba antes. Es interesante saber que Dave y Eva son hermanos y que su hermana Anna también canta y ha sido parte de la banda durante un tiempo. Su padre ha sido un pedazo de batería de Rock desde los 70 ¡y sigue dando conciertos! En 2015 la banda dio muchos conciertos y se decidió empezar a componer. Llegaron los primeros conciertos y se siguió dando pasos. En 2016 yo entré en la banda para cubrir a Oxi, por falta de tiempo debido a sus estudios, y, finalmente, me quedé en abril de 2016. Ganamos un par de concursos y decidimos dejar volar el viejo nombre y convertirnos en “Willow Child”. Cerramos este episodio cuando le pusimos el viejo nombre de la banda a nuestro primer EP. En 2017 se unió Flo, nuestro nuevo guitarra, y ¡voilà! aquí estamos. Creo que he mencionado algunas de las bandas en las que nos inspiramos en la pregunta previa, pero en cuanto a referencias a la hora de estructurar las canciones pondría énfasis en Led Zeppelin y Black Sabbath así como Alice in Chains y Kyuss. También hay bandas como Cream que son una gran fuente de inspiración. Aunque esto no es sentarse y decir “¿Cómo habría hecho aquí el arreglo Jimmy Page?” En general no trabajamos así. Nos centramos en cada canción individualmente. Es más el preguntarse “¿Qué rollo transmite?”. Aunque a veces acabamos haciendo referencias a una banda o a una canción en concreto. DenpaFuzz: ¿Cual o cuales son vuestras bandas favoritas de siempre? ¿Y de la escena actual? WILLOW CHILD (Javier): ¡Es una larga lista! Como decía, todos tenemos diferentes gustos musicales. Por supuesto, compartimos muchas de las bandas que nos gustan. Vamos juntos a festivales y conciertos en todo momento. Pero déjame que mencione algunas de las bandas actuales que nos gustan a todos KADAVAR, WUCAN, GREENLEAF, THE GOLDEN VOID, COOGAN’S BLUFF, ASTROBOY, DEATH ALLEY, HORISONT, KING FATHER BABOON (que, además, son buenos amigos), HONEYMOON DISEASE ¡y muchas más! DenpaFuzz: En “Paradise & Nadir”, que ha cambiado respecto a vuestro EP debut? La idea de unión con la naturaleza es evidente, tanto en las letras como en las atmósferas que crean los temas, incluso vuestra foto de promoción en la que estáis en un bosque nevado. ¿Tratáis de alejaros de la vorágine y el estrés de la ciudad?. WILLOW CHILD (Javier) Bueno, el cambio más evidente es la incorporación de Flo Ryan Kiss (ex-Limestone Whale) a la guitarra. Esto ha hecho que podamos contar con teclados Y guitarra en cada canción y, a veces, con dos guitarras. Además, el conocimiento y el estilo musical de Flo han hecho que el proceso de composición de Paradise & Nadir sea más complejo y satisfactorio. La verdad es que das en el clavo cuando dices que nuestros temas ponen énfasis en la naturaleza. Esto se debe a Eva. Ella suele ser la cabeza pensante tras cada tema. Mientras que todos los demás componemos nuestras partes, riffs y fraseos, ella SIEMPRE marca la dirección con sus letras y sus líneas de voz. Por lo que, por mucho que tengamos una idea de por dónde va a ir un riff una vez lo haya escuchado Eva, acabamos haciendo referencia a la naturaleza de una forma u otra. El algo muy característico de Willow Child. No queremos escapar del mundo rápido, momentáneo, complejo y digital del día a día. Sabemos que está ahí y que vivimos en él, pero, dado que la atención y la meditación son cosas que perseguimos a nivel personal, para nosotros es natural centrarnos en cosas más fáciles y cómodas que también tenemos en este planeta. Personalmente creo que hoy en día la mente humana está constantemente sobrecargada por todo lo que el cerebro tiene que procesar durante el día. Me gusta comparar nuestra situación vital con la de los músicos de los 60 y 70. Cuando me levanto le echo un vistazo a mis varias cuentas de correo, a mi Facebook, etc. La mayor parte de gente tiene un Smartphone y está disponible el 90% de su tiempo. Hace 40 años esto era completamente diferente. Para mí es de gran inspiración ver películas o series de ese momento, o leer/ver entrevistas con artistas de los 60 y 70 para empaparme de lo que era su día a día. DenpaFuzz: Aún siguiendo una línea similar, veo alguna diferencia respecto a vuestro EP “Trip Down Memory Lane”. En Paradise & Nadir hay una presencia increíble de sonido de órgano. ¿Esto es consecuencia del accidente de Jonas, que le impedía tocar la guitarra? Parece como si compensara con el sonido del órgano la ausencia de sus acordes de guitarra. ¿Es esto? WILLOW CHILD (Javier) No, la idea nunca ha sido compensar nada musicalmente. Si bien es verdad que Jonas ha tenido algunas dificultades para tocar la guitarra después de su accidente, esto no ha sido parte de la discusión sobre si cogemos otro guitarra o no (Flo). Ha sido un desarrollo lógico. Tenemos suerte de que Jonas haya sanado completamente muy rápido, ya que, básicamente, ha recuperado toda su destreza en la mano izquierda. Pero con Flo en la banda nos dimos cuenta de que teníamos muchas más posibilidades para el órgano. No diré que haya sido un proceso consciente; simplemente nos juntamos para hacer música y dijimos “bueno, parece que los teclados pueden ocupar un nuevo papel.” Y con el teclado teniendo más presencia hemos podido tirar por derroteros más progresivos en las composiciones. DenpaFuzz: Por otro lado, los registros vocales de Eva, parecen que se han vuelto más dulces, con más sensibilidad si cabe. Yo no puedo evitar recordar a Grace Slick (Jefferson Airplane) cuando escucho su voz en varios de los temas del disco. WILLOW CHILD (Eva) He empleado el tiempo que ha pasado desde que grabamos nuestro EP para mejorar mi juego de voces. El incorporar a Flo a la guitarra ha supuesto menos trabajo para mí, por lo que he podido concentrarme en la parte vocal. Ahora disfruto al poner más tiempo y trabajo en las líneas de voz y las letras. ¡Me alegra que eso se refleje en “Paradise & Nadir”! Pero no me identifico mucho con Grace Slick. Honestamente, ni siquiera lo había pensado, aunque quizá el sonido de nuestras voces es similar. Aún así, creo que tenemos estilos diferentes. En cualquier caso, cualquier parecido es halagador pero inintencionado. DenpaFuzz: Asímismo, en el Nuevo disco hay más temas con tintes progresivos e incluso con aires folk. ¿Es una cuestión de madurez? ¿Es este el camino por el que quiere ir la banda alejándose un poco de sonidos más cercanos al stoner? WILLOW CHILD (Javier) Claro que queremos crecer como banda. ¡Es muy halagador que aprecies cierta evolución! Como se ha mencionado, la incorporación de Flo ha sumado un nuevo rango de géneros a la mezcla. El Folk es uno de ellos, como se puede ver. Pero no me gustaría separar la estructura de la canción de los sonidos. Lo que quiero decir es que, aunque no queremos recrear lo que se ha hecho cientos de veces en términos de composición, creo que sí incorporamos sonidos muy conocidos. Por tanto, Willow Child no será una banda de folk tradicional, pero tampoco nos perderemos en estilos muy progresivos. Queremos hacer Rock & Roll, ¡pero la meta es mostrar tantas influencias y parecidos históricos como sea posible! DenpaFuzz: ¿Cómo son esos fines de semana en los que os encerráis y estáis tocando horas y horas juntos? WILLOW CHILD (Javier) ¡Absolutamente! Lo hemos hecho un par de veces durante el año pasado. Nos vamos a sitios perdidos de la mano de dios a ensayar. Podemos hacerlo porque Flo nos permite usar el local de otra de sus bandas (Limestone Whale) en Schwandorf que está a media hora de los bosques de Bavaria. Durante la preproducción y el proceso de composición nos vamos ahí y nos alojamos en casa de los padres de Flo para ensayar, comer (y beber), dormir y repetir. Como resultado acabamos pasando fines de semana haciendo durante 12 a 15 horas lo que nos gusta. Es duro pero merece la pena cada segundo empleado, como te puedes imaginar. DenpaFuzz: Todo ese tiempo tocáis por diversión, o se trata de ensayar y ensayar hasta perfeccionar los temas? WILLOW CHILD (Javier) ¡Si fuera tan fácil! Jajajaja. Es un poco de ambas, la verdad. Queremos que las canciones sean perfectas y pasarlo bien al componerlas. Hay dos cosas que tiene que cumplir para que sea perfecta: por un lado que la estructura sea clara y que tenga sus momentos destacados: paradas, licks, etc; pero también que el sonido acompañe a la temática de la canción (de acuerdo a la letra). Queremos que se tenga una idea de la historia de la canción antes de que se escuche la letra. Supongo que queremos crear una atmósfera que te permita estar listo emocionalmente para las letras. El otro lado es que la canción tiene que tocarse perfectamente. Para ello hablamos MUCHO sobre lo que hace cada uno. A veces tocamos una frase de 10 segundos durante horas hasta que todas sus notas tengan la misma potencia y expresividad. DenpaFuzz: ¿Cómo se os presenta la temporada veraniega con festivales y otros eventos?. WILLOW CHILD (Javier) Tras el concierto de presentación el 11 de mayo en Nuremberg, nuestra ciudad natal, nos tomaremos una semana libre antes de empezar una gira de 17 días. Tocaremos en Austria (Linz & Vienna) y después en Alemania, desde el sur (Munich) hasta el norte (Hamburgo). En cuanto a festivales, tocaremos en WUDZDOG OPEN AIR en Dornstadt (GER) con bandas como MY BABY. El festival destacado para nosotros es el ROCK IM WALD en Lichtenfels (GER). Este es uno de los principales festivales alemanes (o europeos) en cuanto a Vintage-Rock/Stoner-Rock/Psychedelic y estamos súper ilusionados ya que tocaremos con ORANGE GOBLIN, MUSTASCH, THE VINTAGE CARAVAN, SPIDERGAWD, STONED JESUS ¡y muchas otras grandes bandas! Desde DenpaFuzz agradeceros habernos permitido hablar con vosotros y desearos suerte con vuestro trabajo, el cual reseñaremos en profundidad aquí. Y, ojalá os podamos ver por tocando por España pronto. “Starry road” define el sonido que WILLOW CHILD desarrolla en su nuevo trabajo. La banda alemana anuncia la publicación de su doble-Lp “PARADISE AN NADIR” para el próximo 11 de mayo. Poco más de un año ha pasado desde la publicación de su EP debut “TRIP DOWN MEMORY LANE” con el que nos sorprendieron por ejercicio de retro rock con tintes piscodélicos y bluseros. El quinteto formado por Eva Kohl (voces y guitarra) Johnas Hartman (órgano y guitarra) Flo Ryan Kiss (guitarra solista) Javier Zulauf (bajo) y David Kohl (batería). establece una poderosa simbiosis de arreglos vívidos y letras intensas. El quinteto de Nuremberg toca el blues rock ardiente impulsado por riffs de hard rock y los arrebatos psicodélicos instrumentales. Guitarra flotantes, grooves de órgano emocionantes y vibraciones ocultas se unen por una rica composición. ¡El álbum debut de WILLOW CHILD “PARADISE & NADIR” abre la puerta a un cosmos místico!